and also I have to do the work when I have an odd minute free. Somehow one is never expected to have even minutes free. Could gamistress66 and Christine get in touch with me? I'll send you each an ARC of Black Hawk. I had a very hard time -- an impossible time -- deciding who was most helpful. So I picked out the five great comments and did a blind drawing and you two won. I have another copy of Black Hawk -- 'the ARC' to give away. It'll be for further comment or for what was already said or a combination of both. Awesome image and tagline! And the faint gradient in the background. I have a kneejerk reflex against seeing names written in red (it's unlucky in my culture), but even aesthetically I think I prefer the black. I love the single bold red line, which accents the text and aligns it with the color at the rightmost edge. Having it right-aligned also helps offer the feeling of being more integrated with the image, since it's as if it's partially hidden by the door. I'm not as fond as having two full red borders, as it causes a strong "T" configuration within the entire banner, which is a bit odd for me. I'm not sure that you'd want part of your name covered, even if it's the last letter -- it seems to defeat the purpose of marketing your name? I think you could also likely increase the font size on the tagline -- you have the horizontal space for it, and it's hard to read even in the largest size image you have here. Thank you, thank you so much! I cannot express how thrilled I am about the arc- I can't remember when I have been so excited about a book but also because you found my rambling comments helpful in some way. Since I have already put my two cents in on everything I may as well continue. I love the blue and prefer it to the red. I think the blue with the black writing is the most striking and I prefer one solid stripe to two or a broken one. 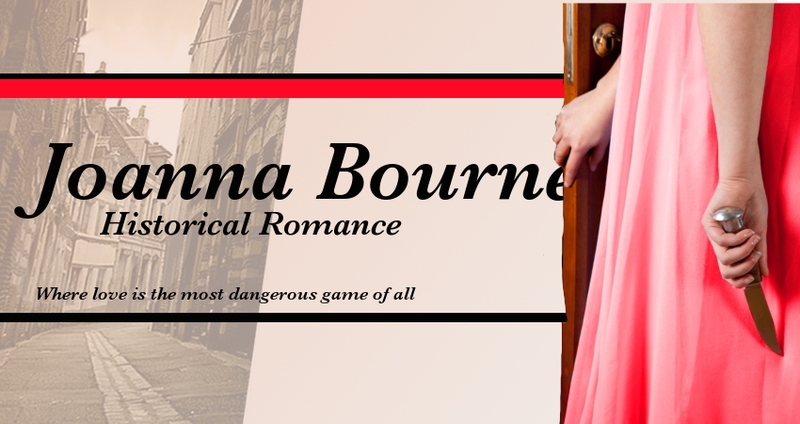 I think the picture of the couple is nice and makes the banner seem more "romance" than just suspense by its addition. I just can't decide where it looks best on the banner. The banner is looking great overall- it's been a lot fun seeing you hone and refine your ideas. For what it's worth, my favorite is the red banner with the city street scene faded in the background - it draws the eye and makes the banner more interesting than if it were just plain. I notice that in all these banners, the 'e' in your last name is getting cut off - you may want to squeeze the picture of the woman over just a smidge so that we see your full name. I agree with you about the red lettering. I think it doesn't work. Same with the blue. I did increase the size of the font on that 'tagline' The actual banner will be fairly large, so that will bring the font up with it. I want it to be at least 12 point in Arial or Bookman, which is readable. Now the end of the name being cut off is me trying to be clever. Trying to make the website visitor 'think' and and 'look at' the name. I hate it when people try to be clever with me, but here I am doing it to other folk. You have been so helpful. So many folk have been helpful. I wish I could give something to all of them. yes. Send me your snail. There's a link to my mailbox over on the right side under my picture. I will send it off to you. I didn't really believe this book was ever going to get off the ground until they sent me the ARCs. I like the top one very well, but with the blue dress instead of red / pink. I like the simple style, suggestiveness. And the simplicity of it. However the lower pink one with the black and white photo of the couple kissing is very nice too. But they definitely look like a young couple to me... so not Maggie and Doyle, or Grey either. I missed the first round and I usually don't troll for ARCs, but I couldn't resist!! I prefer the blue to the red and the black bold lettering. I love the tagline. Don't like the extra pictures in there as it clutters it a bit. Though I understand the appeal of making look a little more romancey with a couple. I might prefer just an enlarged couple picture and not the one with the knife as there's tension and danger in that picture and looks like romance. I agree with the cut off the "e" in Bourne and it bug me a little. Could it be shrunken just a little so it doesn't cut off your name? Or flip it so it faces the other way and then left aligned? I can't wait for Black Hawk!! Because I have an opinion on everything designy... I agree with the commenters above who prefer blue - it feels easier and more inviting (and red is often the color of 'stop'). The broken lines feel more contemporary, so for you I prefer the continuous lines, which feel more lyrical and historical, and therefore appropriate to your work. I love the simplicity of the first blue banner with no picture most of all, or else the red one with the scaled back cityscape. (But, if it were blue!!) I think the couple feels limiting, because your work is about many different couples, and I'd prefer to imagine what they look like myself. And the horses feel Western. I do rather enjoy the knife in hand...I could see any one of your heroines holding one. It says plotty intrigue to me. It feels good and right. and works with your tag. The image and tag work together to suggest the two kinds of danger in your book, love and physical danger. Like everyone else, I can't wait for Hawk either. I'll be buying two copies: one to love and keep and one to abuse and underline the heck out of. I love your writing. Actually, I would like the blue simple one even better if the blue line was touching the black. You have a red version like that. lol. Now I'll shut up! Like all the others I prefer the blue, too. It seems more calming than the red. The red banner is too flashy. I don't like the one with the couple on the left corner. It doesn't have a historical feeling to it. I like the picture with the riders (is it a battle?) and also when your name is written in black. It stands much more out. As for the lines, I like just a simple blue one at the top best. More than that looks a bit messy. I hope it was helpful and not even more confusing for you. ;) Like everyone else, I'm waiting anxiously for Hawk's story! Congratulations to gamistress66 and Christine! I am partial to the blue; I also liked the lavender in some of the earlier banners. For the border, I agree with those who have said that just the top one should incorporate color -- I prefer the line to go all the way across and for the color to touch the line. I like the black lettering. I found myself wondering how it would look with the black line being thicker than the blue/red. Or for the border to pick up the burnished gold of the doorknob, which would also point to the color of the blade. It pains me to admit it, but when I looked at the first set you posted, I didn't realize that was a door (I'm so not visual). I rather like the building in the back ground, but not off to the side as it's too symmetrical and draws attention to the blank space. I'd rather see it take up the whole banner and be more shadowy, as in the inside cover of FR. The problem with that is that it will look like the woman is opening a door onto the outside. If you were to have a scene across the bottom, I'd like to see something that evokes the England/France connection rather than soldiers on horses. This is a silly point, especially since this is a draft, but I think the woman's forearm and hand are too thick. The fingers in particular look fat and clumsy to me. It's not that I'm not all for showing a woman looking strong and powerful. But the figure herself is reed slender. I think the arms and fingers need to match that. Like Annique's hand in the original picture of TSL. By the way, I went to Amazon to find that picture and found Black Hawk available for pre-order, with the cover and everything. Squee! I am surprised how many people prefer the blue to the red. I was expecting the other way round. There is something to be said for leaving the banner pretty much uncluttered, and then adding some interesting pictures just below the banner. Maybe pictures related to the latest book? 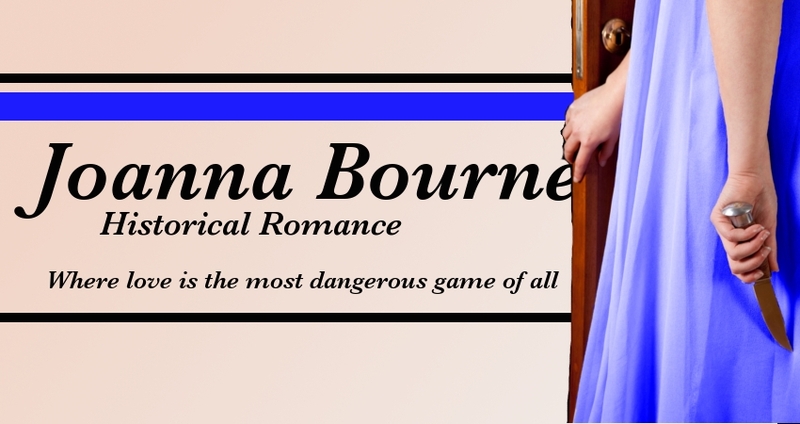 But it's also nice to have the banner say, 'love story', and it doesn't so much right now. I have played back and forth with a background to the banner. The results have been only so so. I seem to get confusion more than enrichment. When I look at the banners out there, they're generally plain backgrounds or simple, pale repeated patterns. I'm trying out the idea of leaving the 'e' partly covered. I dunnoh. I seem to be doing a lot of 'I dunnoh-ing' lately. I am definitely going for the black lettering. I will punch it up if I can. The web designer has a different set of fonts in Photoshop than I do in GIMP. I will see what's available on the web if I do not like any of the Bold Italics she has on offer. Blue seems more popular than red. I wonder if it's the SHADE of red. I, too, fear that the extra pictures, while fine in and of themselves, are cluttery. Hi Jo! I like the first blue option in the post above. I'd move your name over to the left a bit so that the final "e" doesn't get cut off. I think the black text and solid blue line are simple, classic, and clean. I'm not a huge fan of the extra pictures. I love the subheading, "Where love is the most dangerous game of all." What if that were in French? Just a few suggestions...I love your blog and your books! I can't wait for Black Hawk! I like the first blue one best (I'm a little biased as blue is my favorite color). The black lettering is good and I prefer the single blue line that goes all the way across. I like how the e is partly obscured by the door, it's interesting. I'm not crazy about the extra photos, simple is good. I like the fourth one from the bottom, with the red stripe over the black and white city street-- and without the kissy faces. It strikes of romance and intrigue the same way your books do, but without the clutch cover allusion. I am very iffy about adding a second picture to the banner. It's so very hard to do with without looking cluttered and amateurish. I think I manage to hit both those bases when I try this. Interesting that folks like blue instead of red. I think there is a better shade of blue out there somewhere. But, but . . . It's supposed to say, y'know, Romance, that being where the books are shelved . . . Nothing says Romance like kissy faces. Although I do have the same couple undressed from the waist up. Which says, like, serious romance. I am inclined to agree with you that simple is good. Yes. I want to add the other concepts, but I think it would take more visual skill than I posses to add any of those elements and not look like I was throwing spaghetti at a wall. I like French, but I don't think many of the readers actually know it. If I used it on the banner they would become enraged and start crawling the wires of the net, coming after me. I am rather fond of that blue line myself. I'm going to put up another posting above this where I play around with some details and see if anything just strikes me a beautiful. You are quite right about the 'stopped' lines looking modern. I like it, but you are right in that it looks contemp rather than historical. A good design call. Blue line touching the black . . . I have been pondering on this . . . whether the two should be cheek to cheek or have a line between them. I prefer the first example. On my computer screen, the gown looks pinkish, not red. The pink (red) gown looks more feminine then the blue one and perfectly complements the black lettering. It also is the color of love. 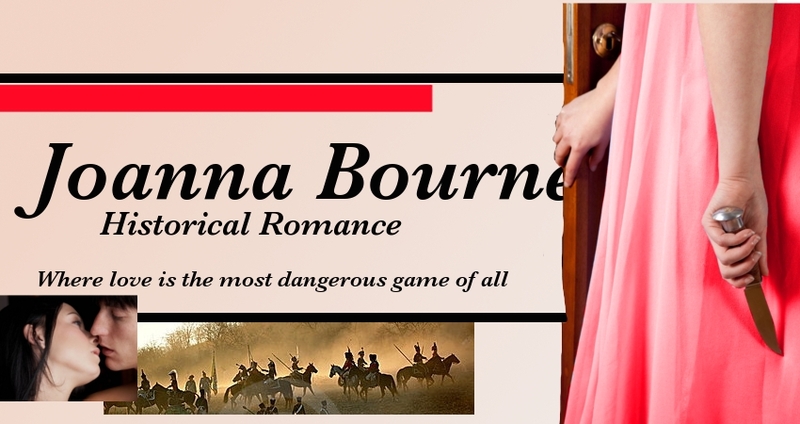 I also like the cute tagline under historical romance. I'd go with the single red line. The double red line looks too much like a border. Perhaps you could insert a few drops of blood on the end of the knife or have it dripping off the knife. That would highlight the danger and intrigue in your books. I agree with the above commenter that suggested you move the main picture ever so slightly, so the "e" in Bourne isn't obscured. Your name should be the centerpiece of the banner and not cut-off. Finally, I think the main picture is enough, but if you decide to go with two, I'd choose the city street. The young man with a gun reminds me of a duel and the men on horseback reminds me of a war (Custer's last stand). Neither event takes place in your novels. I am coming around to the 'single picture' point of view. 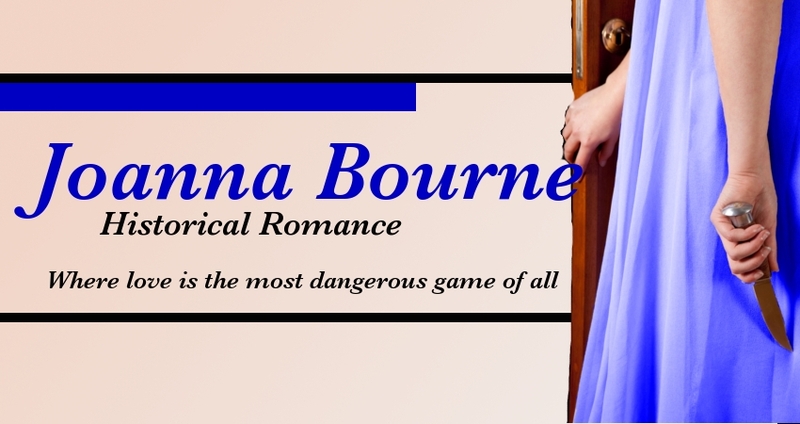 This business of wanting to tack more and more onto the banner is just an example of why amateurs shouldn't be turned loose with GIMP. The whole business of adding different colors to that dress has been . . . challenging. I keep tracking down the Resident Teenager. Me: Ummm ... how do you do that color changing thing again? RT: Ok. I'll go through it one last time. Would you Write It Down? There's more cool stuff you can do with colors, but I know not how. I think my trouble is not so much red or blue -- but the right shade of red or blue. When I was painting the walls of the house I spent weeks walking around with little color swatches, muttering to myself. I ended up with a Laura Ashley off-white for most of the place. Really pretty. Maybe that's why I have a soft peachy shade for the background. I really like the very last one b/c of the two mini photos at the bottom. The e on bourne gets covered up maybe a little too much on that one though. I like the mini photos myself -- but I suspect it is not good design. Y'know how some people can always tell whether something visual 'works'? I just can't. I'm 'design-blind'. Red is Better! Name should probably be in black. Take out the red line. Move your name over to left. Line up the bottom images. LAUGHING OUT LOUD. That's all. I think whatever you do will be good. We all love your books! A lot. The red has a nice jolt to it, doesn't it? It's not fixed in stone, but I think I'm going with blue. It's a blue different from what's in this posting. A more subtle blue. I WANT to be a vivacious and wild, 'red' person, but I think I'm a milder and more retiring 'blue' type. This is a sobering realization. I'm going to post the final concept image on the blog just right in a minute or two.